The Connecticut Sun continues their offseason of celebrating their players. This week the program focuses on Lexie Brown. The Duke graduate was drafted ninth overall by the Sun in the 2018 WNBA Draft. 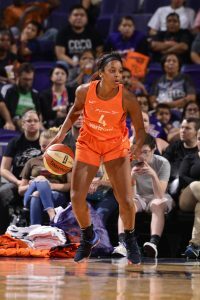 She started strong for Connecticut, scoring a career-high nine points at Phoenix on July 5th and appearing in 22 game. You can see Brown’s photo gallery from 2018 HERE.